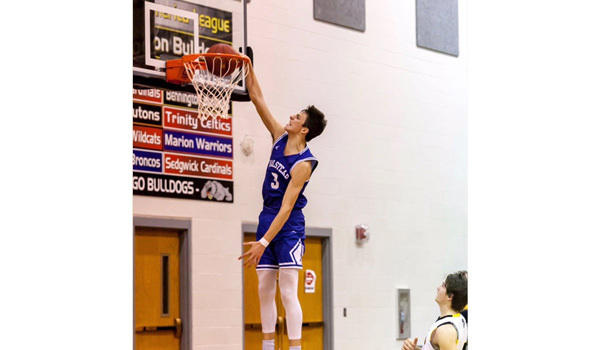 Andrew O’Brien of Halstead is a rare 6-foot-6, combo guard, at the 3A level in Kansas, for that matter at any level in Kansas. O’Brien can play shooting guard or point and handles the basketball very well. What sets him apart is he can also play in the post and is a very good rebounder on the defensive end. Last season, O’Brien helped Halstead to the 3A state championship, averaging over 10 points per game. The Dragons did graduate all-stater Kason O’Neal but do return Braden Gerber, a second team Sports in Kansas all-state selection in 2018. O'Brien and Gerber are two of the top players in all of 3A this season. O’Brien opened up the 2018-2019 campaign on the right foot with a 44-point outing in the first game of the year back in late November. He also had one of the better dunks in the game that we’ve seen all season in the 66-52 victory over Whitewater Remington. For the season he is averaging 17 points per game and eight rebounds per contest. O’Brien is also an outstanding distance runner, earning Sports in Kansas All-State Cross Country honors this fall. He finished 8th at the 3A state meet at Rim Rock Farm back on October 27th outside of Lawrence. He also earned all-state honors taking 13th as a junior and was part of the 4x800 relay that took second in 3A state track last spring. Halstead currently sits at 7-3 and has a lot of pieces back to what could be another deep run after a state championship under head coach Lonnie Lollar last season. Halstead finished the season 23-2 as they knocked off Phillipsburg 44-43 in the title game. It was the first title since 2001, when star player Dennis Latimore shined for the Dragons before a career at Arizona and Notre Dame. Halstead was unraked to begin the season last year before capturing the title. The Dragons have six state basketball titles all-time. Halstead is currently ranked 10th in the latest Kansas Basketball Coaches Association (KBCA) Poll that was released earlier today. Halstead will be back in action this Tuesday as they open up their own tournament, the 49th Annual Adolph Rupp Boys Basketball Tournament, as they take on Minneapolis. Halstead is the sixth seed while the Lions are the three seed. Also, in the Rupp tournament is Andale, Cheney and Haven who are all off to solid starts in 2018-2019. This feature is presented by The Halstead Bank, a proud supporter of Halstead Athletics. Best of luck to the Dragons in 2018-2019. Both of my parents played college basketball, so basketball has always been a big thing in our household. Bring home another championship and improve my game overall. Well I am a 6’6 guard which is almost unheard of, especially in 3a. I am a good ball handler and shooter so opponents have trouble figuring out if a post or guard is going to defend me because I can get by defenders, and I have a pretty good post game. I’m also a pretty good rebounder. It’s really good. We always do really well at home. We have a GREAT student section that is loud and has a good number of people. Our community does a fantastic job also of supporting us at the games by cheering and filling the stands. We are fun to watch because we like to play unselfish. We get a lot of steals which leads to fast breaks and sometimes dunks. Also the atmosphere of our home games is really really good for a high school game. Strengths are I’ve played tons of basketball in my life and I’d say I know the game pretty well. Shooting and Rebounding are my main strengths probably but I’d say my passing and ball handling skills are also very good and defense is getting there. I also like to play with a lot of enthusiasm and confidence. Weaknesses I get over confident at times which sometimes leads to an unintelligent shot or pass. Braden Gerber is really really good. He’s 6’2 and VERY strong. When he gets a head of steam, you’re not stopping him. He can also shoot it a little bit and is a good passer. Lakin Farmer is also a nice player. Just a sophomore but can definitely hold his own. He stretches out the floor with his jumpshot, and pumps up the team with his energy. He really has a knack for stealing the ball. David Schulte is also a bruiser and professional screener. My favorite thing about basketball has got to be the competition of it. I love to compete and love to win. I’m not going to lie, playing for Coach Lollar is not the easiest coach to play for. But at the end of the day I know he just wants to make me/us the best player we can be. Very good coach. I played AAU in the summer and as a team we played in some scrimmages and found competition at the newton rec often. Mostly Division 2 and JUCO including Fort Hays State, Emporia State, Sioux Falls, Hutch, Barton, Metro State Denver, Cowley, Washburn, Dodge City, Northern OK, Southwestern. As of now just looking for the best fit. Will take a couple visits after the season and decide from there hopefully. I would say for a long time it has been LeBron James. But lately I have really looked up to Cameron Hunt from Southwestern College. My Uncle is the head coach @ southwestern so i’ve been around the program a lot. I worked out with him a bit in the summer and just seeing how incredible his work ethic is and how he constantly encourages his teammates on the floor has stood out to me. Not only is he an incredible scorer but he’s also a great leader. Can take a lot away from watching him play. That’s a tough one but I’m gonna have to go with DeAngelo’s pizza.